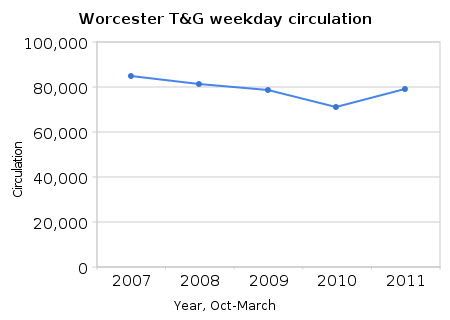 The Audit Bureau of Circulations, using a new system, is measuring daily circulation of the Worcester Telegram & Gazette at 79,168. They note that because the new system measures certain aspects of circulation differently, these numbers shouldn’t be compared with previous numbers. What the heck, let’s make a chart anyway. Under the new system, total circulation is now divided into paid circulation for newspaper copies that are bought by the consumer and a new â€œverified circulationâ€™â€™ category for copies bought by third parties, such as colleges. The new methodology also counts electronic editions and will break out readership numbers for those who get their news using a paid website, like BostonGlobe.com, or through a mobile device or e-reader. â€œWhile the many ABC rules changes make any comparisons to prior years problematic, our readership remains strong,â€ said Tony Simollardes, director of readership and circulation. â€œThe 5.6 percent increase in total readership documented by Scarborough Research as part of the ABC report can be compared directly to the previous year and indicates our print and online products are striking the right chord with our Central Massachusetts audience,â€ he said.